A stellar cast including Academy Award(R) winner Denzel Washington (2001 Best Actor, TRAINING DAY), Gene Hackman (1971 Academy Award(R) Winner, Best Actor, THE FRENCH CONNECTION; ENEMY OF THE STATE), Viggo Mortensen (THE LORD OF THE RINGS trilogy), and James Gandolfini (TV's THE SOPRANOS) resurfaces in this intense hit thriller. In the midst of a global crisis, the USS Alabama receives unconfirmed orders to launch its nuclear missiles -- signaling the start of World War III! The tension escalates as the sub's respected commander (Hackman) and his brilliant executive officer (Washington) clash over the validity of their orders ... battling each other for control of the sub! 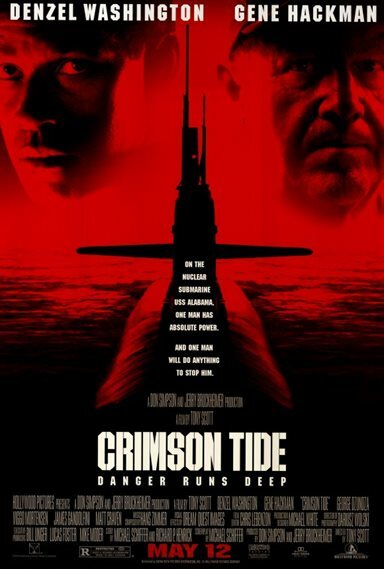 Download Crimson Tide in Digital HD from the iTunes store. Crimson Tide images are © Hollywood Picture. All Rights Reserved.